I’ll be hosting Good Planets on Saturdays during the month of January. Anyone is welcome to submit photos depicting the beauty of our earth to me at lc-hardy AT comcast DOT net for inclusion in the carnival. If you’re not familiar with it, Good Planets was started back in August by Robin Andrea and Roger of Dharma Bums as a way to showcase and share the beauty and wonder of the natural world. Their call for photos has grown into a weekly carnival and now has its own Flickr gallery maintained by Pam from Tortoise Trail. Be sure to check out this week’s photos at Journeys with Jood and please consider submitting a photo or two during the month. 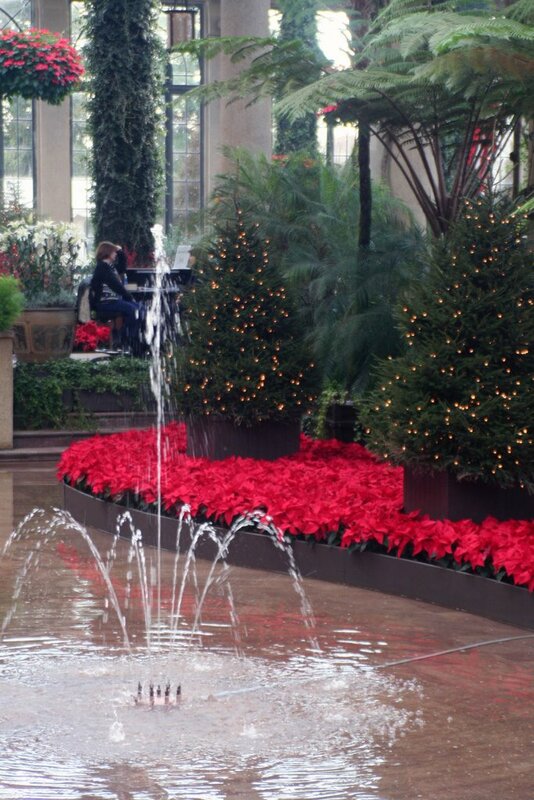 Comparing the conservatory at Longwood Gardens to a greenhouse gives the wrong impression. When I think of a greenhouse, I think hoses and dirt and uncomfortable heat. 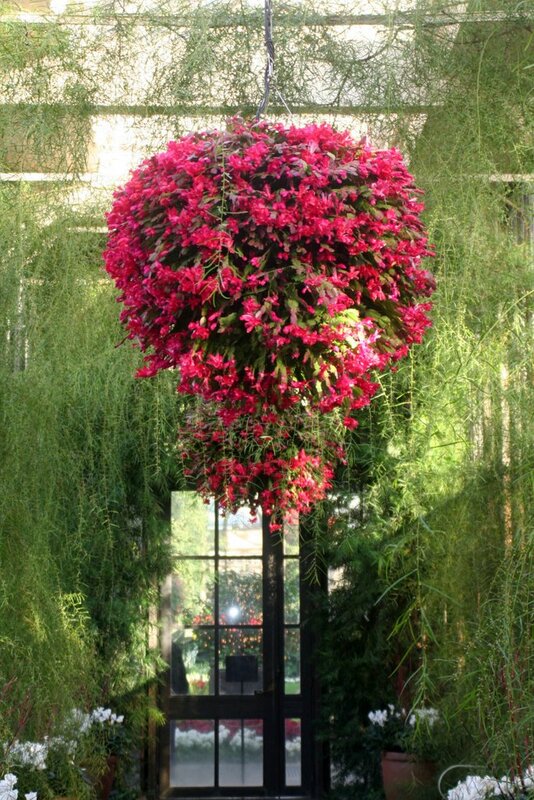 The conservatory at Longwood is a 4 acre garden that just happens to live under glass. You stroll from garden to garden hardly aware that you’re inside at all, except for the occasional temperature change when entering one of the areas with plants that have special needs. The only other *famous* garden I’ve visited is the Brooklyn Botanical Garden, so I don’t have much to compare it with, but I was very impressed. Everywhere I looked there was something beautiful and absolutely no sign of the behind-the-scenes work that goes into caring for a garden of this magnitude. I did not see a single insect and every plant, every leaf was in perfect condition. 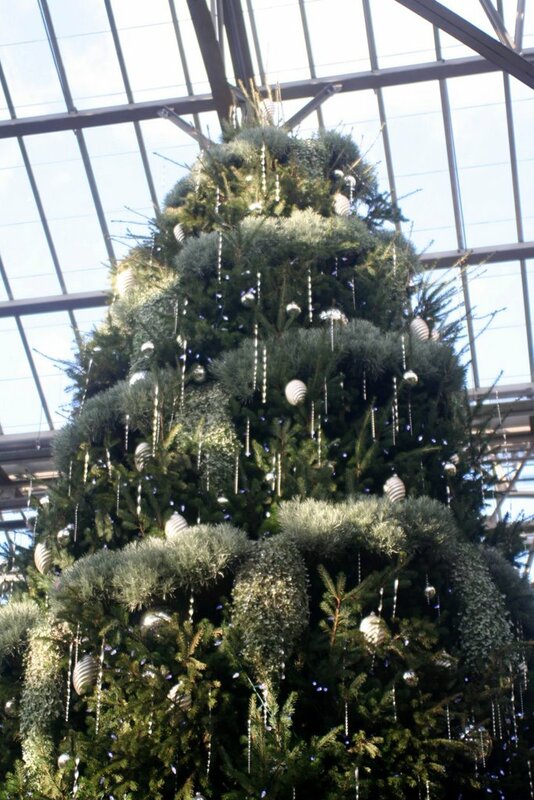 How do they do that with more than 200,000 visitors during the Christmas season? The photos I’m sharing today were taken in the main holiday display areas – the Orangery, the East Conservatory, and the Exhibition Hall. The other areas also had holiday displays, but they were more subtle and in keeping with each garden’s theme. 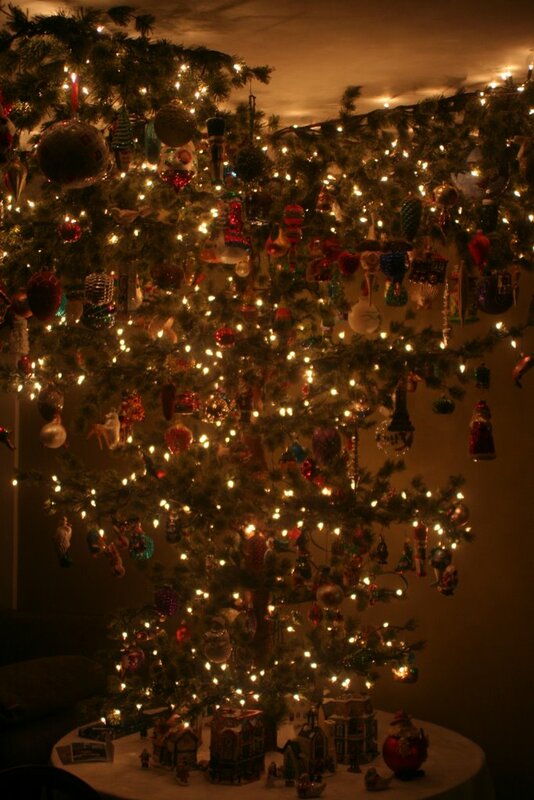 The pic above is the 25 foot Douglas Fir decorated with a living garland. 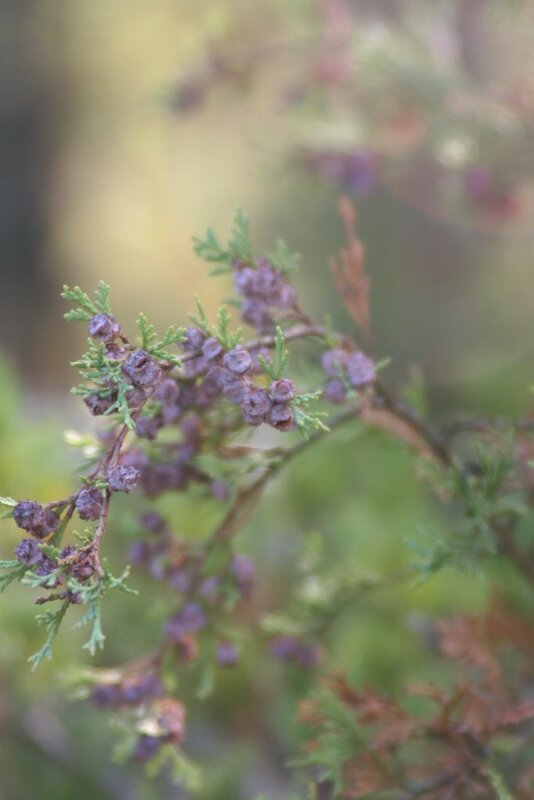 Of course I didn’t write down the name of the plant and can’t remember what it was, but it reminds me of an artemesia. Poinsettias were everywhere, of course, and while I don’t much like this plant, I do have to say that they looked very pretty. Narcissus, amaryllis, primroses, and lilies were heavily used. I liked all but the lilies; too strongly-scented and associated with Easter (and funeral homes) in my mind to enjoy them. 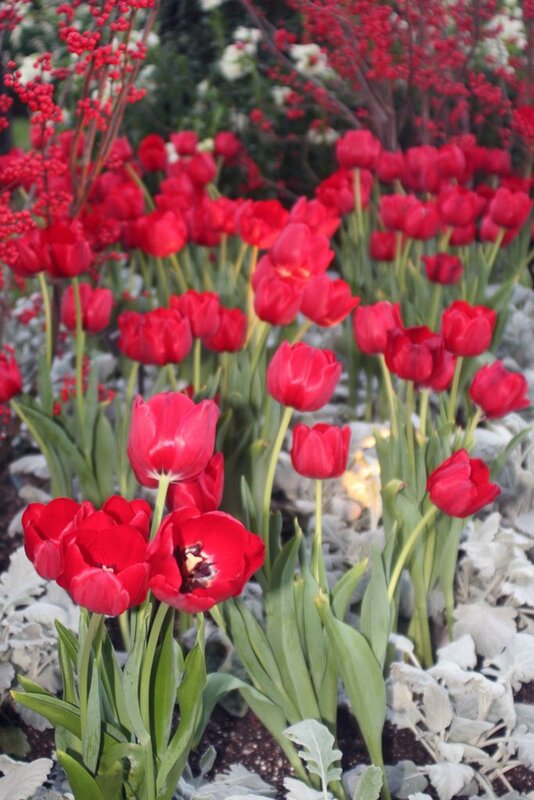 Here’s a plant combination you’d never see together but under glass – tulips in the foreground and winterberry holly in the background. The holly was used in most all of the displays and was striking! Does anyone know if winterberry holly is deciduous? I don’t grow it, but my husband was surprised to see a holly without any leaves and I wonder if they weren’t removed just for effect. Will have to look that up in one of my garden books. I bought a few of the books for sale in the gift shop that describe the history of the gardens and have pictures from all seasons. Were my first visit in the spring or summer I don’t know that I would have even bothered to go into the conservatory – the outdoor gardens and fountains are so beautiful in the photos. I plan to visit again and see it at all seasons. 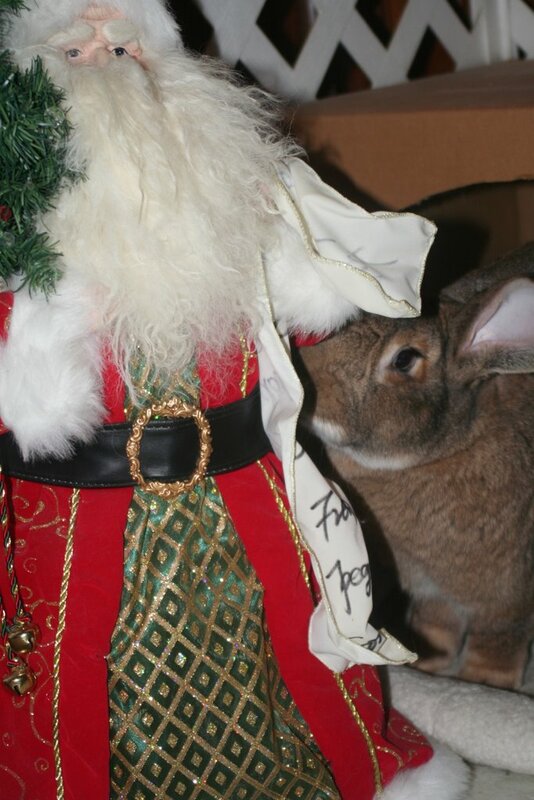 This explains why Santa didn’t bring any gifts for the bunnies – Boomer ate his list! I’d been trying to get some *posed* pics of the bunnies to maybe use next year on Christmas cards and brought the Santa doll from its usual spot just outside the bunny room and placed it next to where they were lounging. For the most part they were afraid of it; then they did what all bunnies seem to do to learn about new things – they tested it with their teeth. They are very suspicious of anything new or out of place and will approach the suspect object on tippy-toe with their necks stretched out – very cute to see this survival strategy in action. Usually it’s not hing more dangerous than a misplaced dog toy, but anything smelling like the dog is enough to send them to the other side of the room with a thump. They’d been investigating the Santa doll for a week or so during their daily forays into the living room – they still won’t hang out in there other than a quick dash behind the couch – and I had hoped they were comfortable enough with it that I might get a few cute pics. Not exactly what I had in mind, but they made me laugh, as usual. 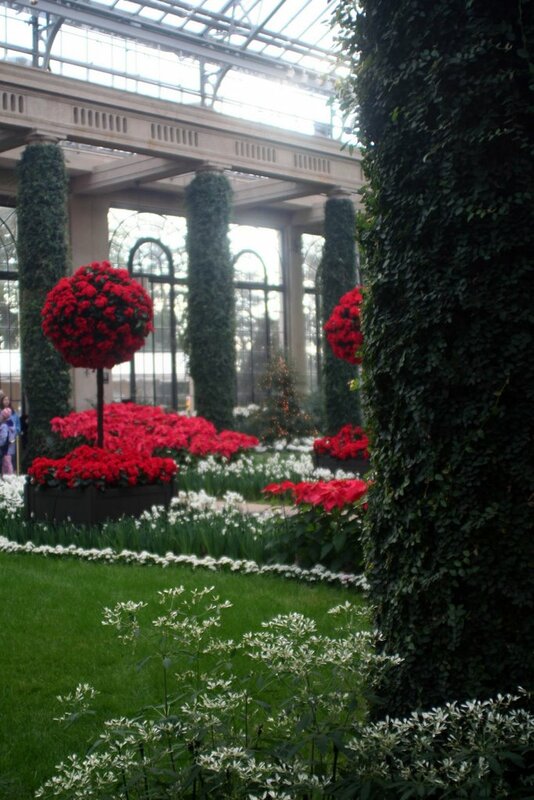 I’ve always wanted to visit Longwood Gardens in Kennett Square, PA. This is their centennial year and my husband and I have the week off, so we decided to take the trip today and see their Christmas display. Of course this week after Christmas is their busiest and neither of us do well with crowds, most certainly not after 2+ hours in the car, but the crowds weren’t bad until we were ready to leave. We spent a few hours wandering around the indoor conservatory and then walked the grounds for an hour or so at dusk and left just as the outdoor lights were looking their best. I had to do a lot of experimenting with the camera to be able to get decent pics of the gorgeous light festival, but I managed a few to share. This first pic is a favorite from the Beech Allée; at the end of a dozen or more Beech trees was a display of snowflakes and stars that seemed to be falling from the sky. This blue spruce at right was gorgeous decked out in frosty blue lights and icicles. 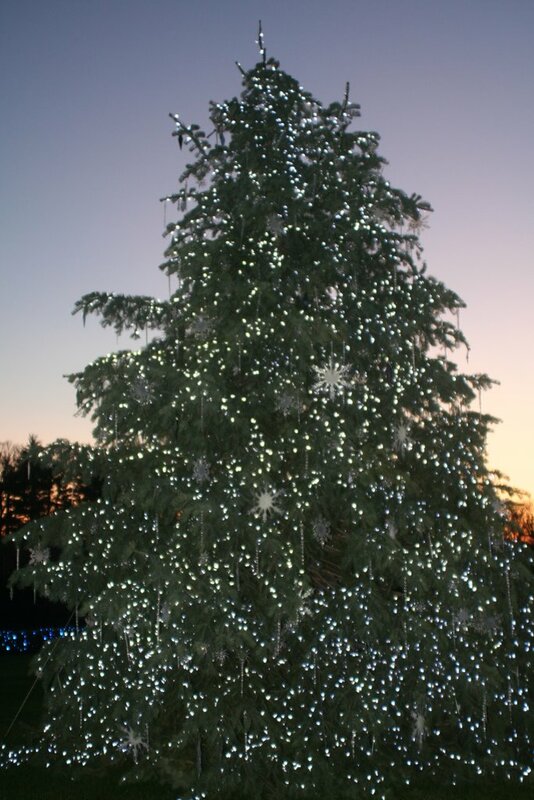 This is the main tree in the fountain garden which is done all in blue lights – really beautiful. There was a lot that we didn’t take the time to see in our hurry to be on our way home, like the ice-skating performance and lighted fountain show. 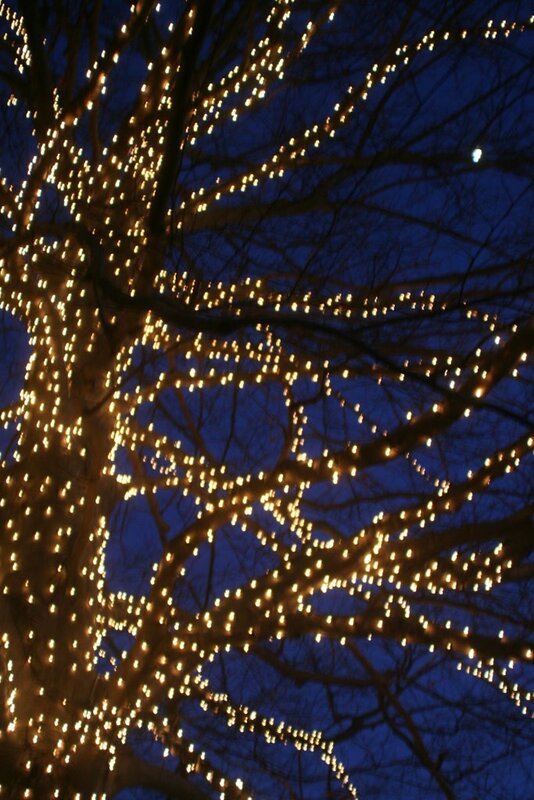 I enjoyed just wandering along and seeing the way each tree was lighted to its best advantage. Many of the light displays had a garden theme – daffodils, crocuses, lilacs and wisteria formed from lights were blooming in the garden beds along the pathways – very unique and beautiful, but hard to photograph in the dark. 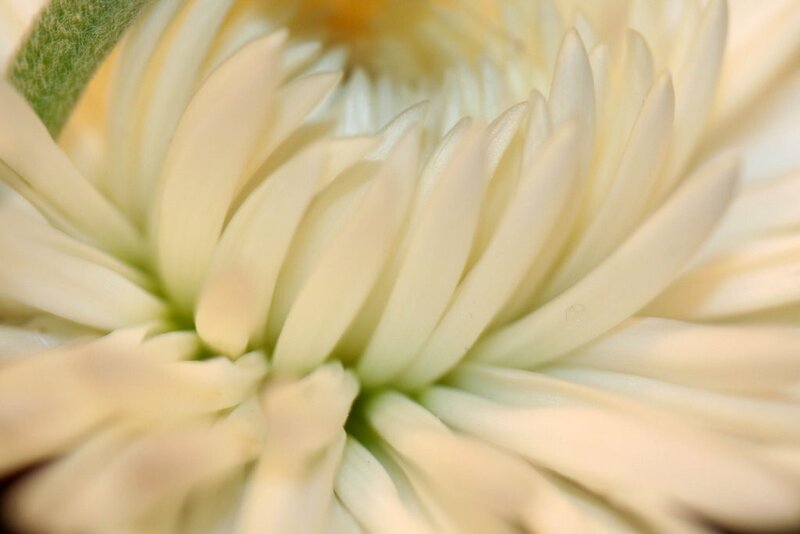 Tomorrow I hope to share some pics from the conservatory. From Patrick at The Hawk Owl’s Nest. The idea is to post the first sentence of the first post of each month. A new year of blogging will soon be upon us and with it the challenge of 365 days worth of posts. Some days it’s so easy; on others I’m glad to have the regular weekly or monthly fixtures like the Borland posts or the bunny fixes that don’t require very much thought. I haven’t decided yet what I’ll do instead next year, but will have to come up with something besides Borland’s monthly musings, as much as I enjoy them. He brought that macro lens that I had asked for and he brought my husband the 24-in-1 ladder thingamajig that he wanted. There was food and laughter and the chance to spoil our nieces and nephews and Richie’s mom in a way that we wouldn’t usually. We had the evening to ourselves to enjoy our gifts. I had to take a few pics with the new lens to show my husband what it can do; in the same way he had to take the ridiculously heavy ladder out of its box and demonstrate for me just what its purpose is. I think both of us are glad to have the other ask for a particular gift – I don’t much care what it is or what it does – only that he wants it and wouldn’t buy it for himself. We’re not extravagant people, but at Christmas it’s nice to throw frugality to the wind. As happy as I am with Santa bringing the macro lens that I wanted, it’s not my favorite gift. Actually, there are two favorites. One, from my husband, is a tree identification guide that he picked out all by himself. I love it because it’s useful and shows that he does sometimes listen to me when I rant about wanting him to help me learn trees. 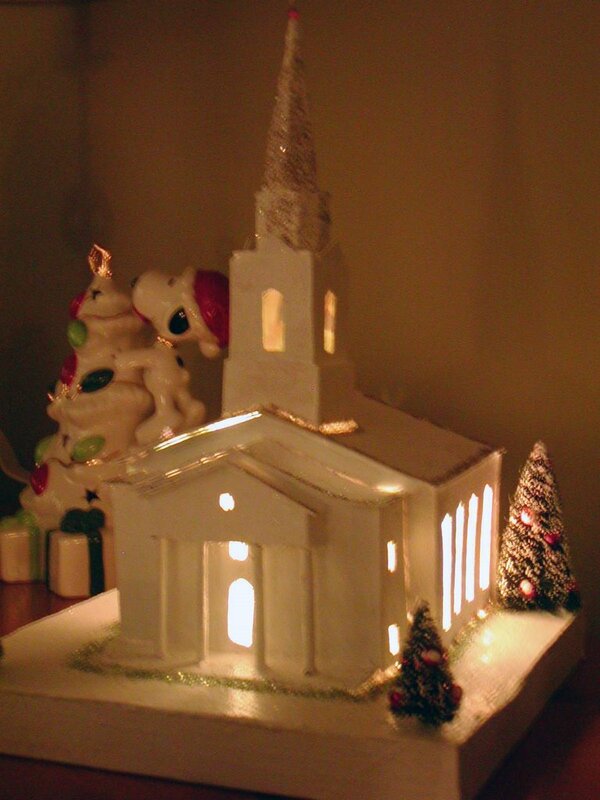 The other favorite, pictured at right, was made by my brother Brian and is a model of our church. He made it entirely from cardboard to look like the village buidlings that surrounded the train set we had as kids. My SIL had been telling me for weeks that Brian was making me something, so I didn’t know what in the world to expect. I never would have expected this. Anyone want to share what their favorite gift was, expected or otherwise? Happy Christmas to you! Yes, it’s supposed to look that way. 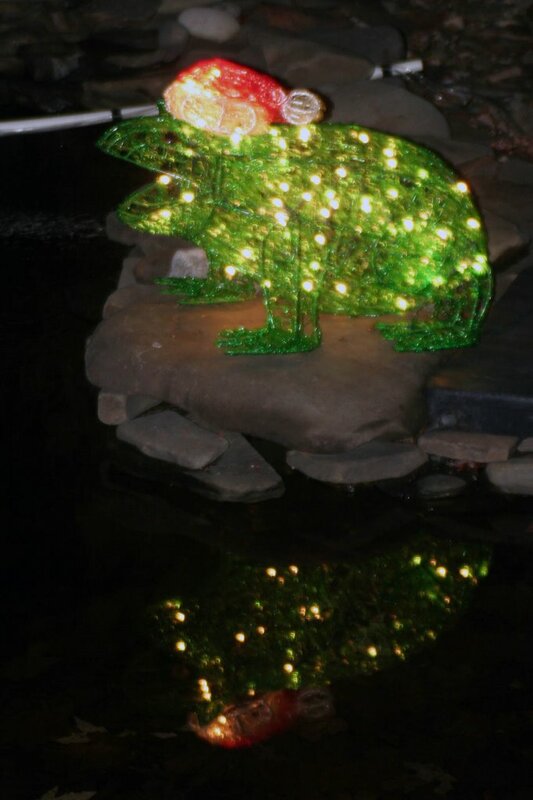 This frog perched pondside is the extent of our outdoor decorating this year – I like it, but worry that it might be keeping the fish awake! My husband loves outdoor decorations and would have the yard filled with obnoxious stuff if I let him have his way. He came home with this gem following an unsupervised shopping excursion with his brother a few weeks ago. It makes me laugh when I see it there in the middle of the dark yard, so it can stay. We’re just about ready for company tomorrow; the house is mostly clean, the gifts are wrapped and under the tree, and my husband is out doing the traditional *cookie run* to our friends. In good years we bake; the last few we’ve bought delicious trays of the best Italian cookies we can find to give as gifts for neighbors and coworkers. I have some cooking to do still and then plan to spend the rest of the night staring at our pretty tree from the couch. Santa dropped the ball with not having these available in time for Christmas delivery. Just what every bunny-loving gadget geek needs!